Spring is an odd time for salads. We’re tired of the bitter greens (looking at you, spinach, kale, Brussels sprouts) that have carried us through winter but we’re still weeks away from the juicy tomatoes of summer. 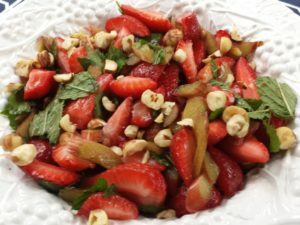 This is the time for asparagus, peas, strawberries, rhubarb, and tender field greens to burst forth in course salads that are so satisfying you’ll be singin’ in the spring rain. We used our proprietary algorithm (hours on Google search) to find the newest and best recipes using ingredients that are in season now. Our sources included cooking magazines, television programs, books, and blogs that consistently receive high ratings. From that bountiful pool we selected seven favorites. 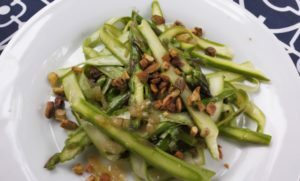 Thinly shaved raw asparagus—easily done with a vegetable peeler—is dressed with a vinaigrette of minced preserved lemons, and topped with chopped roasted pistachios. 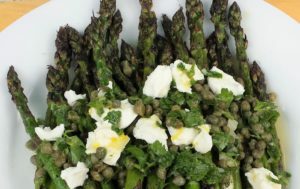 Use the freshest asparagus you can find because its flavor is what makes this an extraordinary salad. Baby beets come into season just as strawberries arrive at spring markets. 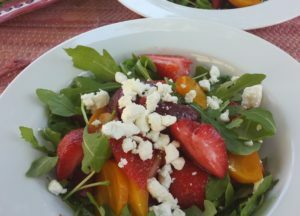 Combined with wild arugula and topped with crumbled goat cheese is a nice way to use them together. Don’t worry if you don’t have some of the fancy ingredients. We used white wine vinegar, skipped the Cava, and used goat cheese instead of ricotta salata. 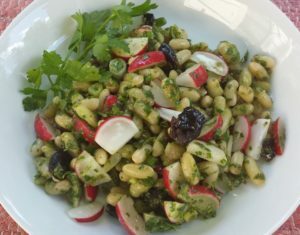 The secret to this recipe is to split the peas in half, which transforms them into slivers of crisp fresh pea essence. 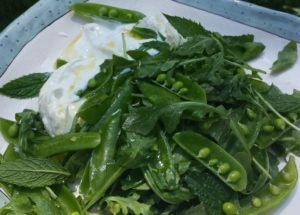 And it’s simple to prepare—toss the peas with arugula and herbs and pile over a portion of creamy burrata. We’ve grilled asparagus before but mostly we burn them into charcoal sticks. Then we discovered this secret—partially cook the spears before putting them on the grill. You’ll get nice charring without turning them into ashes. Double the caper salsa—it’s good over grilled chicken or tuna, and will keep for a few weeks in the refrigerator. An unexpected flavor combination that works brilliantly. The key is to slice the rhubarb very thin and let it macerate for a good 30 minutes before tossing with the strawberries and mint. The hazelnuts add both crunch and a buttery texture that offsets the crisp rhubarb. A healthier way to eat this traditional spring combo than a sugar-laden crisp. We were attracted to this salad because it is so pretty and bright. 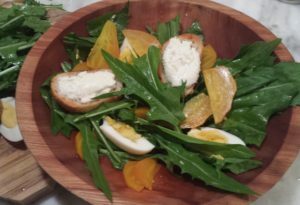 There’s not much yellow in the spring market, but a few golden beets and quartered eggs serve as bursts of sunshine in the bowl. Dandelion is a slightly bitter green, similar to escarole in flavor, but much more tender. Most supermarkets carry dandelion greens but you want only the tender young spring shoots. Try farmers markets if you’d rather not scrounge around your backyard. Recipe from The New York Times. This salad is a meal in a bowl. The pairing of soft buttery beans—the recipe calls for cannellini but we used flageolets—with crisp radishes is not new. It’s the vinaigrette that makes this salad stand out. Don’t be put off by the anchovies. They add that umami all the TV chefs rave about. Instead of opening a can of little filets, use anchovy paste, which comes in a tube and will keep in your fridge for a very long time. 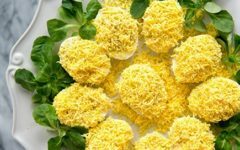 The salad can be made up to a day in advance, but add the radishes just before serving to preserve their crispness. Some of the best recipes are not on the internet, as shocking as that may be. 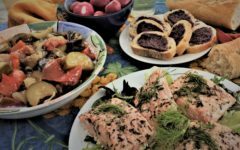 Main-course salad cookbooks, like Salad for Dinner, by Tasha de Serio, and Salads: Beyond the Bowl, by Mindy Fox, offer a wide selection of imaginative salads that can include beans, grains, charcuterie, and seafood, as well as vegetables. We like both books. The authors are professional chefs, food writers, world travelers, and farmers markets junkies, and they bring their innovative spirit to the subject of salads. Note: Many of these recipes call for fresh lemon juice. If you’re making more than one salad, or making salad for a crowd, that can mean squeezing a lot of lemons. We found that Lakewood Organic Pure Lemon Juice is the next best thing. It is cold pressed so preserves as much fresh flavor as possible in a bottled product. Good for salad dressings, marinades, cocktails, lemonade, and, as one Amazon reviewer confesses, for making hard lemonade. Smørrebrød. Hygge for the palate. 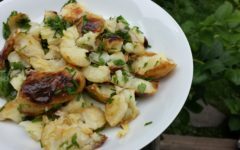 This post was originally published on June 2, 2017, but the salads are as fresh as ever.